Snap! Level 1 is described in the video below. This is the simplest level of programming for the Finch. It does not require students to read text or use numbers. The four arrow keys move the robot. The up arrow moves the robot forward for 1 second, while the back arrow moves the robot backward for 1 second. The left and right arrows turn the Finch left and right, respectively. The seven blocks with colored circles can be used to change the color of the Finch’s beak. Two of these blocks are shown below. The black circle turns the beak off. The block with a lightning symbol controls the Finch’s buzzer. This block makes the Finch play a sound. 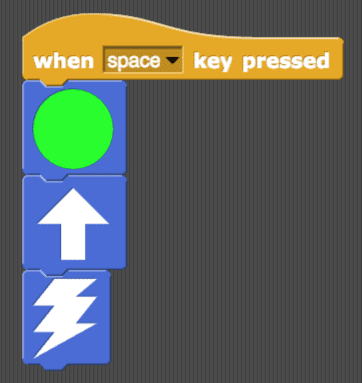 To create a program, students should connect blocks below the when key pressed block. The program will run when the spacebar is pressed.